Whenever I do my talks, it’s hard for me to not include two plants that all gardeners should have. They are White Gregg’s Mistflower and Almond Verbena. No other plants attract beneficial insects like these do. Here’s more information about these two easy-to-grow perennials. Gregg's Mistflower Eupatorium wrightii (Ageratina wrightii), Blue form is Eupatorium or Conoclinium greggi. PLANT CHARACTERISTICS: Deciduous shrubby perennial. Lacy perennial with delicate lavender flowers from July to October. Does well in sun or light shade. Attracts butterflies. Spreads by rhizomes. Should be pruned to 3” after first hard frost. 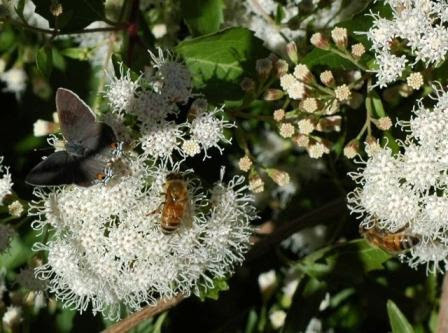 White mistflower is a low-growing, spreading shrub with intricate leafy branches that bear clusters of fragrant white flowers at their tips in September and October. HABIT: It grows on rocky limestone hills and slopes in the Guadalupe, Chisos and Davis Mountains in the Trans-Pecos. Most Eupatorium species like moisture, but E. wrightii is more drought tolerant than most, although it may need watering during the summer in dry areas. White mistflower's profuse blossoms attract butterflies and hummingbirds. Its small stature makes it most appropriate for gardens. Heavy shearing in the winter will promote a denser shape and more flowers the following year. FLOWER COLOR: white but there is a blue variety as well. BLOOM: late summer through fall. FRUIT CHARACTERISTICS: dry five-angled achenes. Height: 10’ - 15'. Spread: 8’ - 10'. NOTES: Native of Argentina, it has an upright habit with slightly weeping, sometimes ungainly branches. In mild winter areas, the mature plants reach 15 feet in height and 6 feet in width. 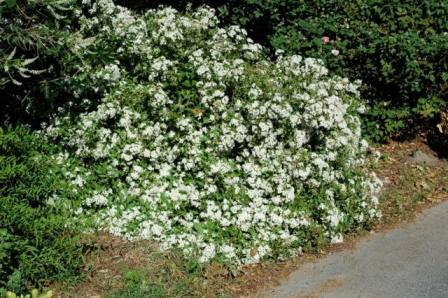 At the branch tips are highly fragrant, delicate white flower spikes which sway gracefully at the slightest breeze, sending their aroma wafting over great distances. 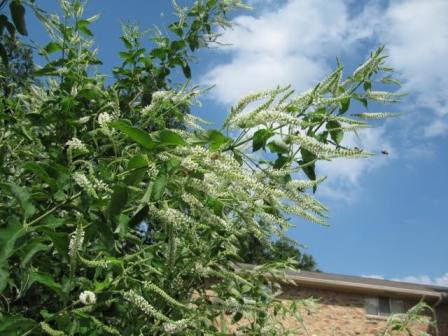 The buddleia-like flowers are produced in cycles from early spring through summer to fall. The wonderful flowers are a magnet to butterflies, bees, wasps and other nectar feeding pollinators.